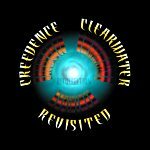 RECOLLECTION is Creedence Clearwater Revisited's Live Album. It was recorded over three shows in 1997, November 13, 14, 15 in Edmonton, Grand Prairie, and Calgary . All in Alberta Province, Canada. 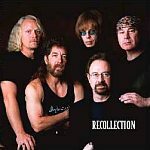 Featuring 22 classic CCR tunes from "Suzie Q" to "Up Around The Bend", it�s a double CD over two hours long. Release date in North America is scheduled for June 9, 1998 on FUEL 2000, an MCA Records special products label. European release shall be on SPV Records, from Germany, around the same date. Buy this Album directly at the River Rising CDNOW on-line Records Store, or from Blue Meannie Records, California. 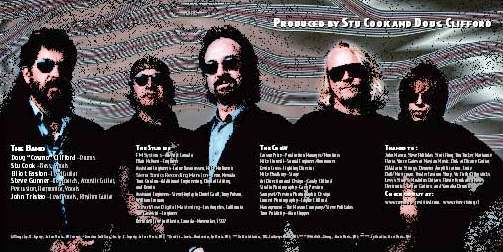 I HEARD IT THROUGH THE GRAPEVINE - Full version, 15'21"
WHO'LL STOP THE RAIN / HAVE YOU EVER SEEN THE RAIN *not together on the CD. UP AROUND THE BEND 38 secs. WHO'LL STOP THE RAIN- Doug's ending rolls. FORMATS - Samples come in two formats, REAL AUDIO and MP3. REAL AUDIO - Whole songs for 28.8 Kbps modem connection, Stereo. Streaming Audio means you listen to the music without having to wait for the file to download. You get the full song, too. MP3 - FM (Hi-Fi) quality, Stereo, each one is about 550Kb and lasts about 30 - 40 secs. Download time (on a 28.8 modem connection) is from 3 to 6 minutes. REAL AUDIO - If not already installed in your system, you need to download the Real Player 5.0 which is free at the Real Audio Website. REAL AUDIO - you click on the name of the song [Real Audio column] and wait for the Real Player to make the connection and start playing. MP3 -You need to download the file [MP3 column] and save it to your Hard Disk first. Next, you must open the Player and run the file. The WinAmp/MacAmp player runs like the CD player in your PC. The "search" funcion is at the open/close-looking button on the Players�s faceplate. On Windows systems, the WinAmp player has an EQUALIZER function. Pressing the little �"EQ" button on the faceplate will open a 10-band graphic equalizer. We strongly recommend you use the EQ to get the most from these Hi FI files. Please note that, while Real Audio brings you the whole song, the MP3 format - albeit a short sample - is of better quality. The River Rising Web thanks CCRv for letting us use these sound clips. 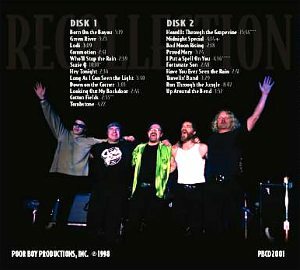 All images on this page from Recollection (via Stu Cook). I Heard It Through The Grapevine written by Whitfield-Strong; Cotton Fields written by Hudie Ledbetter; The Midnight Special, traditional, arranged by John Fogerty; I Put a Spell on You written by "Screamin'" Jay Hawkins; Suzie Q written by Hawkins, Lewis, Broadwater; Up Around The Bend, Who'll Stop The Rain, Have You Ever Seen The Rain, Bad Moon Rising, Lookin' Out My Back Door, Written by John C. Fogerty.